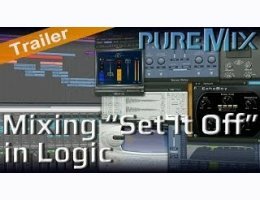 In this 2 hour long video, Fab Dupont mixes the Pop Song "Set It Off" in Logic Pro. In this one hour fourty-ish video, Fab Dupont mixes the dance-pop song "Set It Off" from scratch, starting with the producer's rough mix, ending with a finished mix, all done within Logic Pro. Learn how to mix a whole song : where to begin, what processing to apply to dance music drums, bass and vocals, how to give life and movement to a steady synth track by using side-chain tricks, and much more. The mix of this great radio-ready song is a concise illustration of the techniques that are used in today's musical productions, designed for optimal attention-catching from the listener, resulting in giving as much interest and character as possible to each individual track. Using only plug-ins and no hardware, Fab Dupont takes the all-in-the-box mixing process one step further. Whether it's for creating specific tones for one track, or to give the whole mix a creamier and more consistent sound, Fab demonstrates once more than one does not necessarily need any outboard gear to achieve an amazing professional-sounding mix.